An interesting, albeit fairly minor, figure in mid-century rock, Harris is most notable historically for her appellation which offered further proof that rock ‘n’ roll music was thriving – and was commonly acknowledged in the black community – in the late 1940’s. Harris was born Erlyn Johnson in 1914 Arkansas, a cousin of Louis Armstrong and set out on her own while still a teenager, presumably with the thought of making it as a singer. Though reputedly she didn’t start singing professionally until 1939 when she was 25, she had already been engaged to singer Billy Eckstine which gives some indication that she was around show business in one form or another well before she drew notice at Club Plantation in St. Louis at the end of the 1930’s. Along the way she also found time to graduate college and own a restaurant but her music career really began in earnest in 1940’s New Orleans when she married popular dancer Ike “Streamline” Harris and the two of them appeared around the city at the many clubs that existed at the time. As New Orleans was the birthplace of rock ‘n’ roll in 1947 and since many of the bandleaders at the clubs she performed in were making records in that style over the next few years it’s not surprising that she incorporated it into her repertoire. 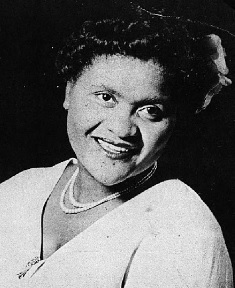 Her signature song “Rock And Roll Blues” not only helped to spread the term of the music itself, but also gave her the nickname she’d carry once she signed to DeLuxe Records, who’d all but cornered the market on New Orleans rock at the time, in early 1949. Though her releases were popular locally, the label was caught in an ownership battle between its founders Jules and David Braun and Syd Nathan, who owned King Records and had looked to take over DeLuxe after buying half of it and taking on national distribution. When Nathan wrested control of the label a number of Braun signees were casualties of the company changing hands, Harris among them. She later recorded for Chess Records but by 1951 had returned to club work in the south, then retired from music in 1953, remarried and lived until 2004 in Los Angeles and Las Vegas. Her time as a rock artist was short-lived but her records as well as her name served as important historical touchstones confirming the widespread recognition of rock music among the original black audience of the late 1940’s whom most histories ignored or dismissed altogether.